Gilbert Stork, superintendent and president of Cuesta College since 2010, has announced his retirement as of June 30, 2018. Stork, who has been employed at Cuesta College in San Luis Obispo for more than 50 years, is the college’s longest serving employee. Cuesta College Board of Trustees President Barbara George praised Stork for his leadership. Stork’s career at Cuesta College began two years after the college opened its doors in 1967 when he was hired as a physical education instructor and assistant football coach. From 1970-1977, Stork served as a mathematics instructor, during which time he also served as the division chair of the physical sciences and mathematics division. In 1977, Stork was promoted to associate dean of instruction and then to dean of instruction in 1979. 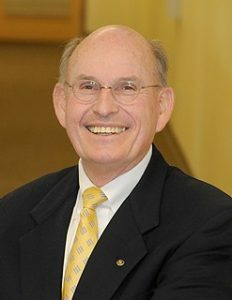 In 1990, Stork was hired as the assistant superintendent/vice president of student services, and retired from that position in 2004. Immediately thereafter, Stork assumed the role of interim vice president/assistant superintendent of student services, then interim dean of humanities, followed by interim dean of workforce and economic development and then superintendent and president. Stork earned bachelor’s and master’s degrees in mathematics from Cal Poly San Luis Obispo and a doctorate in educational administration from Brigham Young University. Cuesta College will launch a nationwide search to replace Stork.